A friends little boy is turning 3 and we were invited to a party for him this week. We don't normally do gifts between our kids, but because we were seeing him for the occasion I figured it would be nice to have a gift for my little miss to give him. I had a look through my supplies and realised I had the right thing sto make an Eye-Spy bag, so that's what I did! It's one of those bags filled with beads (the ones you can use in doll/bear making) and a few little toys mixed in so then when they look through the window panel in the front they can try and find all the things in there. I meant to take a picture of all the things I was about to put in there and print it out as a little reference for him, but I forgot :( Oh well, he will still have fun looking for the things and he even came and sat a couple of times and had a look again which was lovely considering we were at a playcafe and he left the 'fun stuff' to come and play with it! 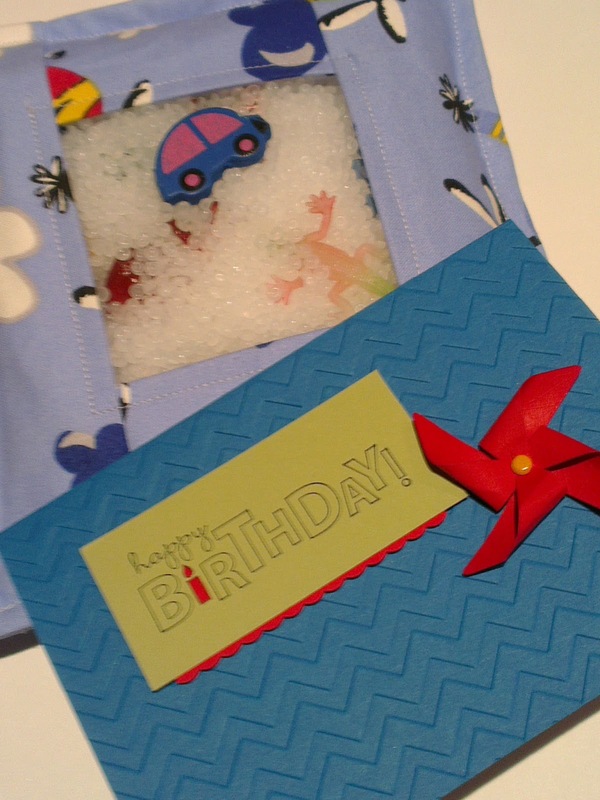 And you can also see the little card I made to go with the gift - love the pinwheel die!